Citizen’s Voice Tv : Deepika Padukone and Ranveer Singh are all the world can talk about these days with minute-to-minute details pouring in all over media outlets. The latest footage that has come afloat is making fans all around swoon over the power couple as it shows the new groom bringing the protective bodyguard in him out to the surface to shield his significant other from the frantic crowd of paparazzi at the Mumbai airport upon their arrival back home on Sunday. In the circulating video, the 33-year-old Befikre actor can be seen putting his arms around his new bride in an attempt to protect her from the commotion, all the while he requests the reporters to back off. 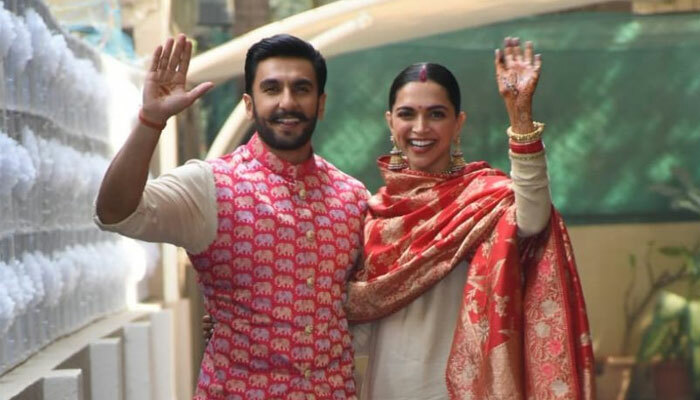 Upon their arrival at Ranveer’s Mumbai residence for Deepika’s Griha Pravesh, -an Indian ritual commemorating the bride’s first step into her new home; the two took a few minutes to step out and greet the fans and reporters swamped outside the house.